The influence of arts patron, collector and philanthropist John Kaldor on contemporary Australian art will explored in a new documentary backed by Create NSW and the ABC, the third project in the organisations’ three-year Documentary Feature Fund joint initiative. Samantha Lang will direct the film, which has the working title Kaldor Public Arts Projects, with Felix Media’s John Maynard producing and Bridget Ikin executive producing. Lang and Maynard previously collaborated on feature film The Monkey’s Mask. Screen Australia has also provided major production funding, in association with the Asia Film Investment Group. From creating a living canvas on which to project a new vision of Sydney as an international landmark with Christo and Jeanne Claude’s ‘Wrapped Coast’ in 1969, to unearthing the remains of the Garden Palace with Jonathan Jones’ ‘barrangal dyara (skin and bones)’ in 2016, the Kaldor Public Art Projects have been significant drivers in site-specific, socially engaged public artworks. The documentary will track how Kaldor first set Australia as a stage for international contemporary art practice and continued over the next five decades to transform landmarks around Sydney into sites of desire, dreams and delirium. The Create NSW and ABC Arts Documentary Feature Fund is a three-year joint initiative to fund one new feature-length arts documentary per year. 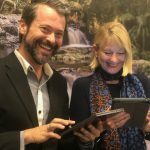 Create NSW contributes $100,000 to each production with the ABC allocating a $150,000 license fee. Each film funded through the initiative receives a world premiere at the Sydney Film Festival prior to screening on ABC. Previous films backed via the initiative include Kriv Stenders’ The Go-Betweens: Right Here, and Olivia Martin-McGuire’s China Love. Emerging NSW filmmakers are being asked to Go Viral!